Unroll fruit flavored snacks; remove paper. Fold Sizzling Red/Yellow fruit flavored snack in half so the yellow is folded over the red to create an orange color. Gently stretch the folded fruit flavored snack before cutting in half horizontally, to create 2 orange strips. Roll up each marshmallow in an orange fruit flavored snack strip to cover sides and tops. Press open ends of fruit flavored snack together to cover marshmallow. Cut 2 leaves from the Blazin’ Blue/Green fruit flavored snack. Insert 1 of the pretzel pieces and leaf on top of each marshmallow to make stem and leaf of pumpkin. Insert lollipop stick into bottom of each marshmallow. Decorate side of each marshmallow with black icing to look like a jack-o-lantern face. Nutrition is estimated based on partial portion of fruit flavored snack products used. 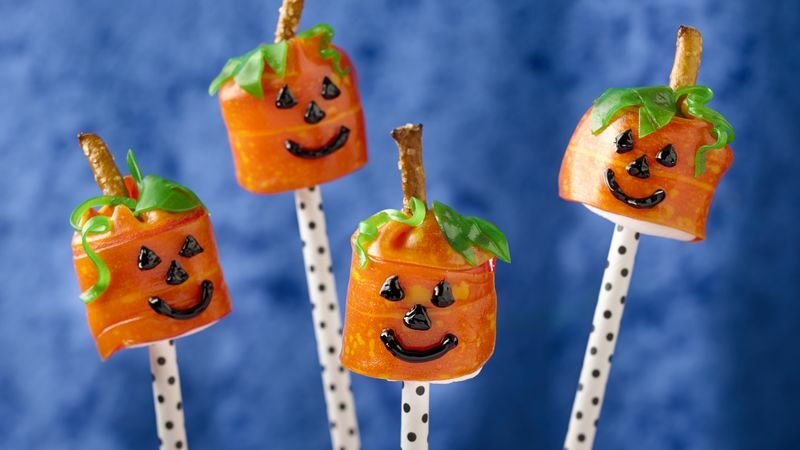 Instead of using lollipop sticks, place these pumpkins on top of store-bought brownie bites, or create a pumpkin patch by placing the pumpkins on top of crushed chocolate cookies! If you can find them, use orange Fruit Roll-Ups® fruit flavored snacks that are sold in some stores--Cherry Orange Wildfire® or Punch Berry®. My Halloween buffet always needs one fun and fab focus, and I found a good one this year – Fruity Pumpkins! A lit Jack-o'-lantern is a ho-hum centerpiece for your Halloween food table. Really. Like, isn't that what everyone would think of? You want something more creative, more colorful – you know, something unique that'll make all the ladies go "Awwwww!" like they just saw a cute costumed little kid, and make all the guys snag one and snarf it down. So this year, imagine these at the center of all your hallowed eats – perfect little pumpkins that greet your guests with a grin! Fruity Pumpkins in a chocolate cookie-crumb patch! Wrap the Fruit-Roll Ups around the marshmallows, then decorate. Serious ease – so please – make these!